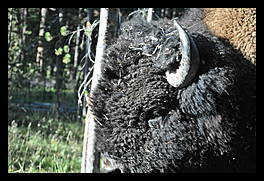 The most recognizable and easy to find animals in the park are the bison and the elk. 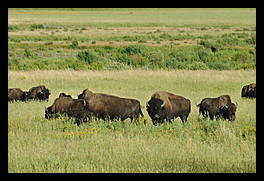 Just drive around and you will see them grazing or walking down the road. 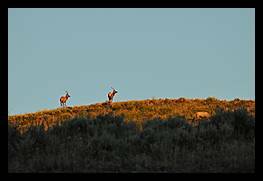 For the dedicated, you can go out at dawn or dusk in search of more elusive animals. It was a chilly morning and the grass was covered in frost. 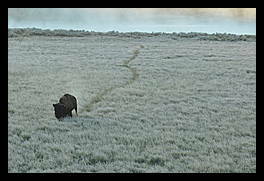 The bison walked across the field leaving a visible trail through the grass. 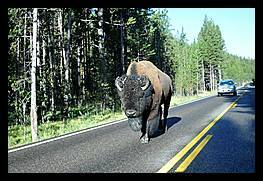 The bison are perfectly happy to take the road if it is going where they want to. When you get behind one you just have to pass it. This is one of the reasons it is important not to speed in the park. We drove by one on the road at night and it was very hard to see. 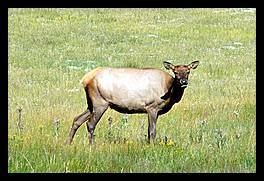 A herd of elk were eating grass by the side of the road. This one decided to look at me. 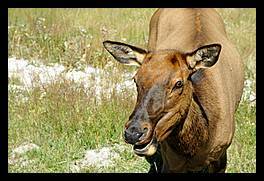 An elk chews thoughtfully on her snack. A small blade of grass still pokes out from her mouth.